Staples from Best Materials are available in all popular sizes with the best prices. Our staples are only the highest quality and make the difference in whether a project is a success or failure. 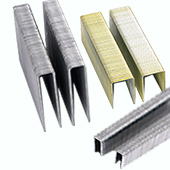 We have 304 stainless steel staples, 316 stainless steel staples, galvanized staples and more. Select from the fasteners below to find out more product details and view tool compatibility. If you do not find the staples you need, please email us and we will gladly assist. Stainless Steel is a metal alloy that in and of itself is corrosion resistant without the addition of any chemical coatings. Stainless steel provides superior protection to even double hot-dipped galvanized and will sustain a longer life than any of the above-mentioned fasteners. Stainless steel will not bleed into cedar or redwood. Stainless steel meets specifications for ACQ and other pressure treated lumber. All our stainless steel fasteners meet or exceed the AISI 304 grade for stainless standards. Laboratory chemical analysis on the stainless steel guarantees its consistent composition. We have the best prices on stainless steel L-Series narrow crown 1/4 inch crown 18 gauge staples. Our narrow crown staples fit All Standard 1/4" L-Wire Staplers.